Founded in 1994, Crown Castle International (CCI) began operating as a real estate investment trust (REIT) in 2014 for tax purposes and is the largest provider of shared wireless infrastructure in the country. Crown Castle owns and leases more than 40,000 towers and 65,000 miles of fiber supporting small cell networks across every major U.S. market. The company also has a small cell platform with 65,000 small cell nodes on air or under deployment. Towers account for about 70% of Crown Castle's revenue. The company leases its towers out to wireless carriers, which need Crown Castle’s infrastructure to provide wireless services to consumers and businesses. Tenants deploy communications equipment, coaxial cables, and antennas at the top of Crown Castle’s towers that transmit signals between the tower and mobile devices. Most towers have the capacity for at least four tenants, and the REIT's average tower has 2.2 tenants. Small cell networks and the fiber cables connecting them account for the other 30% of Crown Castle's revenue. Unlike towers, small cells are much smaller and typically located outdoors and often attached to public infrastructure, including utility poles or street lights. Small cells are commonly utilized by wireless carriers in denser, more urban areas to augment the capacity provided by towers and add capacity to their networks. The big four wireless carriers (AT&T, T-Mobile, Verizon, Sprint) account for 73% of Crown Castle’s site rental revenue, and the company is completely focused on the U.S. wireless market, where over 70% of its towers are located in the top 100 largest markets. That's in contrast to American Tower (AMT), the other telecom tower REIT, which is heavily focused on overseas markets (about 75% of its towers are international). Over 80% of Crown Castle’s revenue is recurring, and most of its site rental revenue results from long-term leases with initial five- to 15-year terms and five- to 10-year renewal periods thereafter. Crown Castle has grown its dividend every year since becoming a REIT in 2014, and management targets 7% to 8% long-term annual dividend growth. Despite its customer concentration, Crown Castle’s business model is attractive for a number of reasons, beginning with its predictability. The company has an average remaining customer contract term of five years. These agreements represent $23 billion of contracted lease payments, providing excellent cash flow visibility. Crown Castle’s tower leases also have built-in price escalators, which are expected to continue adding around 3% to the company’s annual earnings growth. Small cells enjoy annual price escalators as well, although their range is closer to 1.5%. In addition to annual rent escalators, tower economics are attractive because very little cost is involved to add additional tenants. In fact, the company enjoys a 96% incremental margin when it adds an additional tenant to one of its existing towers. In other words, if a new tenant brings in about $25,000 of additional rental revenue, for example, Crown Castle keeps about $24,000 in gross profits. The operating leverage in this business is tremendous, and with an average of just 2.2 tenants per tower (less than half of capacity), almost all of Crown Castle’s wireless infrastructure can accommodate additional tenancy. As a result, the firm's outlook for organic cash flow growth is solid. As data growth continues accelerating (mobile data usage is expected to double every two years), it seems reasonable that demand for Crown Castle’s towers and small cells will also rise over time as carriers invest in their networks to handle increasing traffic. In fact, executives of all four major U.S. telecom companies expect network spending to remain a strong priority in the years ahead. While the planned (but yet to be approved) T-Mobile and Sprint merger could give carriers more bargaining power with tower operators, carriers still have no substitutes for wireless infrastructure, which is mission-critical for their businesses to operate. At the end of the day, the sharing of Crown Castle's infrastructure across multiple parties provides the lowest cost and fastest time-to-market for its customers. By collocating on shared wireless infrastructure, wireless carriers only have to pay for their proportional usage of the infrastructure. Instead of needing to occupy an entire company-owned tower themselves, carriers can rent only the space they need to enhance their network coverage and continue servicing their customers. As a result of these factors, tenant leases have historically enjoyed a high renewal rate. Non-renewals have averaged just 1% to 2% of site renewal revenues over the last five years, for example. Besides network coverage concerns, part of the stickiness is due to the fact that tenants are responsible for moving the equipment they attach to the towers, which costs about $40,000 according to management. Many of Crown Castle’s towers are located in areas with strict zoning restrictions and other regulations, limiting supply and making its infrastructure harder to replicate by new entrants. The company also has helped secure its future cash flow by making thousands of land deals over the years. Crown Castle now owns 39% of the land its towers sit on, and 80% of all of its land needs are under 20-plus year leases. Crown Castle has also made strategic acquisitions to help expand its portfolio in some of the best markets in the U.S. Some of these recent deals include Sunesys ($1 billion in 2015), a fiber services provider with the bulk of its business in the top 10 U.S. markets; FiberNet ($1.5 billion in 2016), a fiber services provider focused in Miami and Houston; and Wilcon ($600 million in 2017), which has an extensive footprint in Southern California. In total Crown Castle has invested $10 billion into fiber in recent years, including its largest acquisition ever, a 2017 deal to acquire Lightower for $7.1 billion. Crown Castle bought that company in order to double its fiber route network to 60,000 miles (at the time) so it could offer a one-stop shop for telecom companies looking to transition to 5G. Today the company owns 65,000 miles of fiber and is busy connecting small-cell nodes to this network to prepare for 5G. 5G is the next generation of wireless and expected to offer up to 100 times faster download speeds and significantly improving how fast mobile devices communicate with networks. 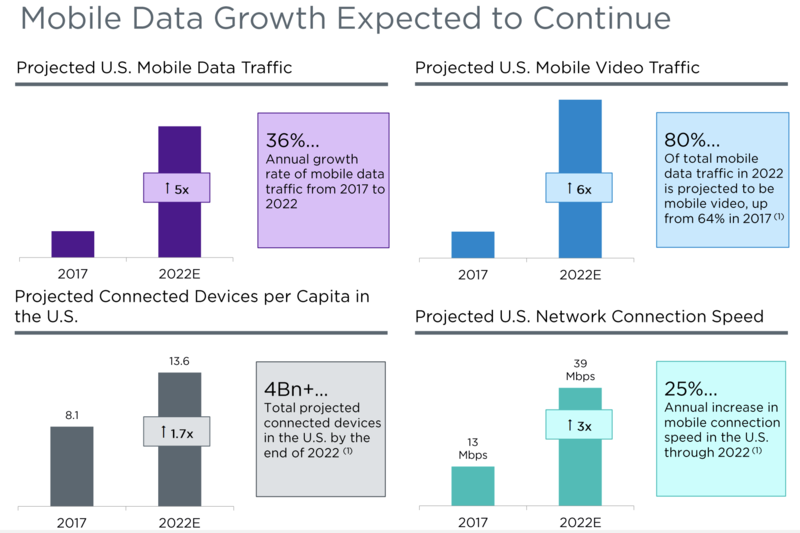 As a result, analysts expect meaningful growth in the number of connected devices, driven in large part by the Internet of Things (internet-connected toys, municipal infrastructure, driverless cars, industrial equipment, and more). 5G will require not only more towers (to utilize certain bandwidths) but also fiber optic lines to carry the data, and small-cell nodes which are best suited to dense urban areas. Thanks to its performance enhancements, 5G is expected to be a key driver of strong U.S. mobile data traffic growth going forward. Small cells should play an important role in enabling 5G because they can provide carriers with greater bandwidth, helping make new technology applications available anywhere at any time on any device. As you can see in the diagram below, small cells can complement towers to help increase network capacity, especially in dense urban areas. By acquiring Lightower, Crown Castle combined its leading small cell platform with one of the best metro fiber footprints in the industry, expanding the company’s capabilities to deliver small cells nationally at scale for its wireless carrier customers. Management believes that the wireless infrastructure will change as we move into a 5G world. 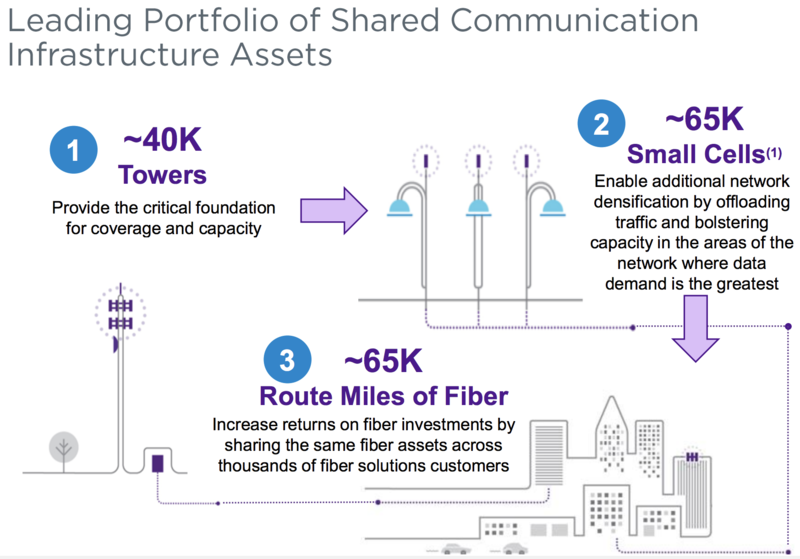 Not surprisingly, Crown Castle has tried to position itself to benefit in the same way with small cells and fiber that it has benefited over the last couple of decades from the tower investments it made. Importantly, all three types of infrastructure assets owned by Crown Castle share many favorable traits, including long-term contracts, high renewal rates, and recession-resistant demand. As a result, Crown Castle seems likely to not only continue paying safe dividends, but also deliver on its long-term dividend growth target of 7% to 8%. It's also worth noting that since Crown Castle generates stable free cash flow, has very low maintenance spending needs, and owns a good portion of its land and properties, the firm can reasonably afford to maintain more debt than the average firm. However, the REIT still maintains an investment grade credit rating (BBB- from S&P), which allows it to continue accessing capital on favorable terms to invest opportunistically in growth projects. Management has vowed that maintaining an investment-grade credit rating is a top priority, meaning investors don't likely have to worry about the REIT taking on too much debt that could force a dividend cut in a recession. Overall, Crown Castle appears to have a fundamentally strong business that enjoys high barriers to entry and seems to have a solid growth outlook for at least the next five years, especially if 5G infrastructure needs play out as management expects. Thanks to continuously growing demand for data and a portfolio of mission-critical wireless infrastructure, Crown Castle has delivered very reliable growth throughout numerous market cycles. The company’s rental revenue and gross income have increased every year since 2002, and that trend seems likely to continue for the foreseeable future. However, as with any stock, there are important risks to consider. The biggest risks facing Crown Castle are customer concentration and evolving technological trends. "This potential transaction may result in a decrease or delay in demand for our communications infrastructure and services, as a result of the anticipated integration of the T-Mobile and Sprint networks and related duplicate or overlapping parts of their networks, which may lead to a reduction in our revenues or cash flows and may trigger a review for impairment of certain long-lived assets." The good news is that T-Mobile has said that its immediate priority is to rapidly expand its 5G network, meaning that the actual amount of reduced towers where their networks overlap is likely to be small. What's more, T-Mobile's plans to grow into a dominant 5G telecom provider (and the 4th largest internet provider in America by 2024) would mean a large need for small cells and fiber, which Crown Castle can provide. Simply put, sometimes carrier consolidation results in more network spending, not less. In fact, citing the Sprint-Nextel, AT&T-Cingular, and Verizon-Alltel mergers, rival American Tower claims enjoyed 20% to 25% more business from each combined entity 12 to 18 months after the deal compared the amount the company was receiving from the individual entities. However, if T-Mobile gobbles up Sprint, then the combined carrier would represent around 33% of Crown Castle's revenue, potentially giving it meaningful pricing power when contracts come up for renegotiation. Yes, the infrastructure assets Crown Castle owns are mission critical and valuable to its customers. But the REIT isn't immune from the economies of scale that such a telecom giant would command, which could result in lower rent or lower annual rental escalators in the future for part of its business. Fortunately, losing a customer is next to impossible given the mission-critical nature of Crown Castle's infrastructure, the nationwide coverage carriers must provide, and the economics of the business (sharing the wireless infrastructure, rather than owning their own, provides carriers with the lowest cost and fastest time-to-market for their customers; it would make little sense for them to own and operate towers themselves). Next, there's Crown Castle's decision to focus exclusively on U.S. markets, but diversify into small cells and fiber, which represents a key strategic choice for the REIT. Where American Tower potentially has to worry about small cells eventually supplanting some of its traditional telecom towers, Crown Castle has potential to benefit more from the coming 5G revolution. However, Crown Castle's strategic decision comes with its own risks as well. Most notably, small-cell networks and fiber are more capital intensive than towers. Due to the complexity involved with laying fiber (right of way, digging up streets, etc. ), fiber operators build out a lot of spare capacity at significant cost, and then scale up tenants over time. Thus it usually takes far longer for returns on investment to rise to decent levels, and long-term returns on invested capital seldom approach the high levels that towers enjoy. Crown Castle is effectively sacrificing the potential for higher profitability to focus on serving as a one-stop shop for U.S. telecom operators. 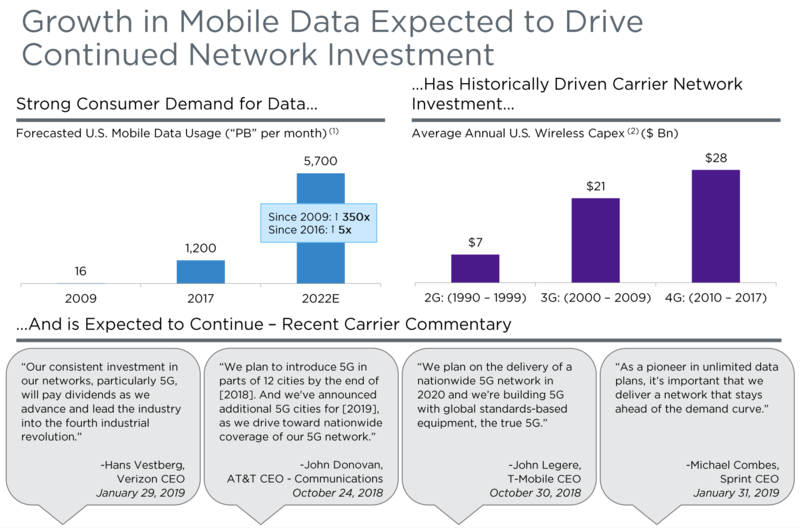 Since 5G is expected to be a predominant user of small cells, the long rollout period telecom operators are likely to need to scale up 5G networks means Crown Castle's small cell and fiber strategy could weigh on profitability for several years. More specifically, 5G is expected to take at least several years just to hit 50% market penetration in the U.S. Yes, telecom companies will be spending a fortune to quickly expand 5G networks ($275 billion over the next decade according to the Federal Communications Commission) but Crown Castle's ability to deliver on its 7% to 8% long-term cash flow and dividend growth target is not guaranteed. Finally, there's the risk that Crown Castle could be impacted by changes in wireless deployment technology. If wireless networks become more efficient (e.g. network sharing) or experience a substantial change in design, demand for Crown Castle’s wireless infrastructure could decline. Other technologies such as WiFi, satellites, and mesh transmission systems could eventually serve as substitutes for the company’s wireless infrastructure as well. None of these potential evolutions can happen overnight, but they could potentially jeopardize Crown Castle’s earnings a decade from now – no one knows. While this risk is rather speculative, it's still important for long-term investors to keep in mind when owning this REIT. Finally, note that near-term demand can be impacted by trends in capital spending by the major carriers. If they decide to pull back on plans to expand their coverage or capacity, Crown Castle could temporarily see reduced demand for its wireless infrastructure. This risk factor doesn’t impact the company’s long-term outlook, but it could potentially cause near-term volatility. Overall, there are few risks that seem likely to jeopardize the company’s long-term outlook. Technology changes are likely to happen at a moderate pace, and it’s hard to imagine any of Crown Castle’s major customers no longer needing its services anytime soon. The investment case for Crown Castle is very interesting. As the demand for data and wireless connectivity continues to grow, the company’s wireless infrastructure should become even more valuable. Crown Castle also has room to add more tenants to its existing towers at very high incremental margins and appears likely to continue enjoying annual price increases across its portfolio of leases. When combined with the industry's high barriers to entry, the lack of viable substitutes, and Crown Castle's greater push into small cell networks and fiber in anticipation of 5G, the company's cash flow and dividend should continue to grow at a healthy pace in the years ahead. While Crown Castle is not without its risks, it seems to be one of the more attractive REITs for investors seeking a combination of income and growth.